Use gnome-terminal as a powerful lightweight desktop environment and graphical user interface that runs on top of a computer Gnu/Linux operating system X server. Basically, will turn the gnome-terminal into a desktop. There is a saying. If you master the command line interface, you'll master the entire system. + Change the gnome-terminal color and the color values in ~/master-command to match your metacity theme. + Do a search for CLI apps. There are lots of awesome apps and commands you can use in the terminal. + here are what you need to install if you are doing this from scratch: A Linux operating System, gnome-terminal, X server, a login manager, metacity. From http://www.reddit.com/r/linux/comments/mw882/gnome_terminal_as_a_desktop_user_interface/ neat, but strange way to do it! There are plenty of moddable window managers out there, and gnome-terminal isnt exactly made for this. @Anonymous "gnome-terminal isnt exactly made for this." Human aren't made for flying either. But we do fly. hey man... nice, something different but useable aren't they? Clever idea, just didn't work for me, ended up with a black screen and the mouse pointer (moving)..
@RiddleBox Double check your .xinitrc file. Instead of using ~/master-command script. Try adding the script directly in your .xinitrc like I said in the post.Make sure it's executable. Hi Salem, love this desktop, just what I want as Unix sys-admin, but I can't get it to work. You talk about the .xinitrc and .xsession files but these have not been created by any of the package installs and I can find no reference to them in your main post above. Do you have another post that I am not seeing? Also lightdm doesn't seem to exist anywhere. Can you tell me how to link .xinitrc with .xsession? And if I use the .xinitrc script should I delete the master-command script? Sorry for the double post, if you check out your youtube account I left you a message with some pictures maybe you can understand better my problem. @RiddleBox Saw the pictures, did read the comments. Thanks for showing your interest in this project. Concerning the pictures, you edited my script by adding this command: exec unity. That is why it loaded everything inside Unity. 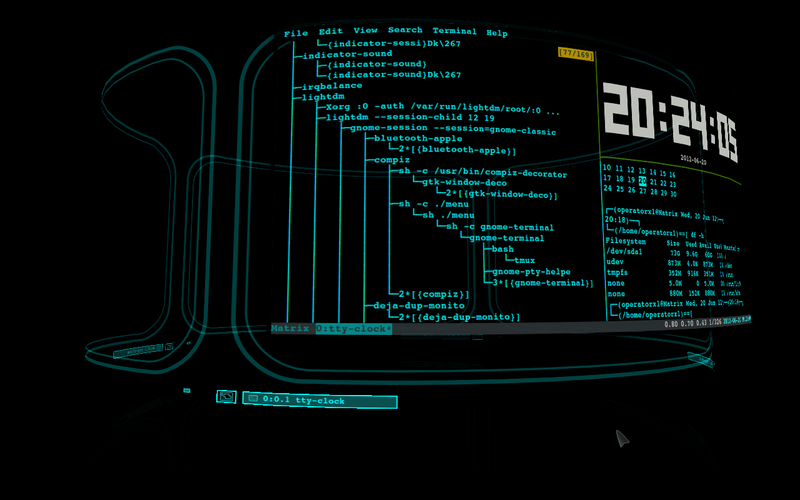 Unity is already a desktop environment, not a window manager. Copy the commands exactly like I posted only, and everything will work just fine. Concerning everything else, like how do you link ~/.xinitrc with /.xsession? Read the post again. I edited the post just for you. If everything is working fine, but you desktop look doesn't look like mine, that is because your desktop theme and mine are different. Plus, you seem to be using Ubuntu. I haven't make a GTK3 version of my themes yet. I might take the time and make a gtk3 theme only if there are a lots of request for it. And again, Thanks for the comments. I think Evilvte would do the same thing but with minmal memory footprint. Hi Salem, just recently I came across your video on Youtube regarding Gnome Terminal Desktop Environment. I think it is super cool. I followed the steps as mentioned but I am not getting the output as you or others are getting, not even black screen with the arrow. I am having LinuxMint-12 on my system. Every time I restart the computer I see LM login window and then standard LM window. I am also looking at fast linux distro that uses less space - found Bodhi Linux and thought of combining your project with it. Could you help me out in figuring where I am going wrong? LinuxMint and Bodhi Linux are already pre-loaded with a Destop Environment; Which will load everytime you start your computer. You'll have to disable or uninstall the DE before you can use a different one. I suggest you install Debian instead as your Linux distro. It allow you to easilly install only the programs that you want. And it's easier to set things exactly the way you want it in Debian. Thanks Salem. You had mentioned in one of your replies on YouTube video to check with the user-defined session. As that would help in changing from default session, I am using Ubuntu 10.04 and that does not have (or maybe I don't know how to change) user-defined session option. In one of the threads I read to change that I must install lightdm..however that didn't work either. Installed Debian as well but couldn't get it work. There has to be another way. I am going wrong somewhere. Prolly I should start the process with current Ubuntu version, which has lightdm and then test it out again. Please read the post again, from start to finish. I edited it with more details. Do not start the process until you understand it. The OS recommended is Debian. If a file is misspelled, saved in the wrong directory, or if you forgot to make a file executable, It will not work. I have followed this tutorial to a "T" and I still cannot get the desktop shown above. I chmod ~/.xinitrc I double check that everything is named correctly but it is still a no go. Is there something i need to do to activate it? Set it as the desktop environment etc? I am a upper-middle level linux user so the topics discussed make sense, but It doesn't seem to work even on a straight Debian 6 install. I edited the post. It's easier to follow now. im fairly new to linux and i just want to say how good this looks. im learning the command line and this looks like a great way to help me with that goal! gonna give ghis a try over the weekend and hopefully i can make it work! Happy to hear that. By the way, this is not about a command line interface only. You can use cli apps or GUI apps. Did you notice, I launched Chromium-browser in the video demo? hey gimme a lil help. um gonna try this, but i dnt knw how to install this. can I load x tru Putty? Putty? So you are a windows user? OK.
Back up your data. Install a Debian based Linux OS. Next, follow the instructions posted here. If you do not already have a Login Manager installed. Install lightdm or gdm. You don't need to install xserver-xorg if you already have an other Desktop Environment installed. I retyped the command.. and now its working..
Now it´s running .... so i know that i need to change the parameters in "gnome-terminalOS-session"... to put wiht that black and blue.. So what do i need to change?? Yeah, this is pretty awesome! Hi, I'm new to linux, and I had gotten this to work. Thank you for your efforts to create such a wonderful desktop environment. Also, thanks for the detailed instructions, but I was wondering how to change the number of workspaces and how they are connected(ie 2X2 square instead of 4X1 line). ALso, when I open libreoffice, the buttons do not look sleek as it does in Ubuntu 12.04. Is this because of something I did wrong?? Hi, I see u did a lot of hard work. Very cool. Figured it out. In my bashrc I have custom parameters, commented them and all work now. Hi Salem. Your desktop is very cool. Congratulations. I have Arch Linux with xfce4 and gnome3. In gdm, when i choose gnome-terminalOS-session, I look a simple terminal with few tabs, but there aren't look like CFD style. I using systemd. This problem? Lightdm doesn't seem to be available for the version of Debian I downloaded. Would something like gdm, xdm, or slim be a suitable replacement? Very impressive idea Salem. I got this to work on Lubuntu 13.04, but I still have terminal tabs that look grey. I've tried applying new GTK themes but they still are grey. What theme file do I need to edit to correct this? Is it GTK2 or GTK3? I can't get it to start, what should I do? Gnome-terminalOS.session doesn't seem to work.